Massage is something I believe I was called to do. One of my earliest memories is of volunteering to rub my mother's sore feet at the age of four! I completed the massage program at Seattle Massage School in 1992. I then received my Washington state massage license (MA#00006126), and began the first incarnation of Imaje Massage Therapy in February of 1993 in downtown Seattle. I currently schedule table massage appointments at my office in west Olympia Tuesday through Saturday, along with providing onsite Chair Massage to a variety of business and state agencies throughout Thurston County during the work week. For over 20 years, I have been blessed to be in a profession that never feels like "work". I still consider it my calling to provide stress reduction, relaxation and pain management to people at all stages of life. As a father I am proud to be able to provide for my family with work that is always challenging and of benefit to all humankind. 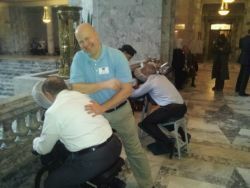 I have provided massage in private practice, spas, and business settings throughout the Northwest. I will continue to learn about and perform massage and energy work (I have been a Reiki Master since 2001), and expand my business to offer a place for others to share their healing gifts. For more information on the types of bodywork I offer, see my Services page.